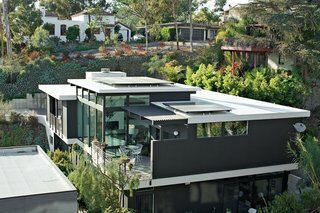 Heading down a narrow street in the Mission Hills neighborhood of San Diego, you might assume the house set low in a wooded canyon is a meticulously updated example of mid-century modern design. Brothers Soheil and Nima Nakhshab are delighted that the dwelling they conceived, engineered, and built might trigger a case of mistaken identity. Notes Soheil, "We love this era of architecture, so it’s a huge compliment when someone thinks we remodeled an existing home."